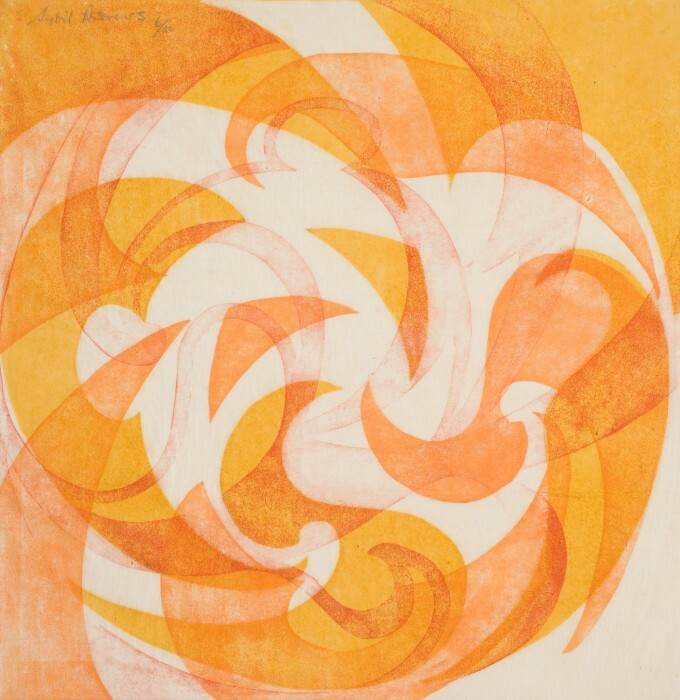 Sybil Andrews was a pioneering modernist printmaker. Having worked as a welder in the First World War she spent time at Heatherley’s School of Art and as an art teacher, before becoming the first secretary to The Grosvenor School of Modern Art. There she studied with Claude Flight and met Cyril Power who became her collaborator and partner until 1938. The atmosphere at the Grosvenor School promoted adventurous and innovative designs with a particular emphasis on printmaking. The prominent art critic Frank Rutter taught a course entitled ‘From Cézanne to Picasso’ and the dancer Helen Wingrave taught a course on contemporary dance. Both these influences are significant in the context of the present work, Pas Seul. The work’s title associates it with a solo dance usually within a ballet. Fittingly, minor suggestions of figurative elements in motion emerge from Andrews’s abstract composition – a rounded head at the top and left of the sheet and flicking heels toward the bottom – but the overall impression is of whirling, frenetic, three-dimensional motion articulated through the artist’s use of successive layers of imprinted colour. Rutter’s classes on modern art likely included mention of the Italian Futurists. Umberto Boccioni’s Unique Forms of Continuity in Space (1913, Tate) and the painting of Giacomo Balla appear to have informed Andrew’s work and encapsulate the Futurist’s infatuation with the dynamism and technology of the modern age. Yet Andrews’s work remains tethered to the human body. In her other work, it is frequently bodies, not machines or light, that are distorted through motion. Rutter is also sure to have mentioned Gauguin in his course. Gauguin’s Haystacks (1889, Courtauld) was at that time owned by Samuel Courtauld and shares the agricultural subject and spatial distortion that repeatedly occur in Andrews later work. Although these associations place Andrews within an explicitly modernist context her working practices were humble and her outlook highly inclusive. She consistently worked with standard household linoleum and used umbrella ribs as gouges to form the relief surface of her print block. With her partner Cyril Power, she produced mass produced (now treasured) posters for the London Underground advertising sports events. Pas Seul, coming before this later work, illustrates the radical heritage Andrews drew from and which energises enduring interest in her work.